Money spent on sending Norfolk and Suffolk mental health patients to other parts of England almost tripled last month to £600,000, new figures show. A spokesman for the Campaign to Save Mental Health Services in Norfolk and Suffolk said: “NSFT and the local clinical commissioning groups need to properly fund both inpatient beds and community teams until there is a decent mental health service in Norfolk and Suffolk. Below, the catastrophic failure of the radical redesign process is exposed in NSFT’s own graph from the most recent Board of Directors meeting. The ramp in the graph represents not only the closure of too many beds but also the meltdown in the community services required to keep people out of crisis and hospital – a direct result of the unfair funding of mental health, the savage and immoral cuts of the radical redesign to crisis and community services to the most vulnerable in favour of ‘innovative’ money pit services, the scandalous redundancy programme and subsequent recruitment crisis, the breakdown of Section 75 agreement and the inability of Kafkaesque NHS bureaucracy to respond with any competence or urgency. 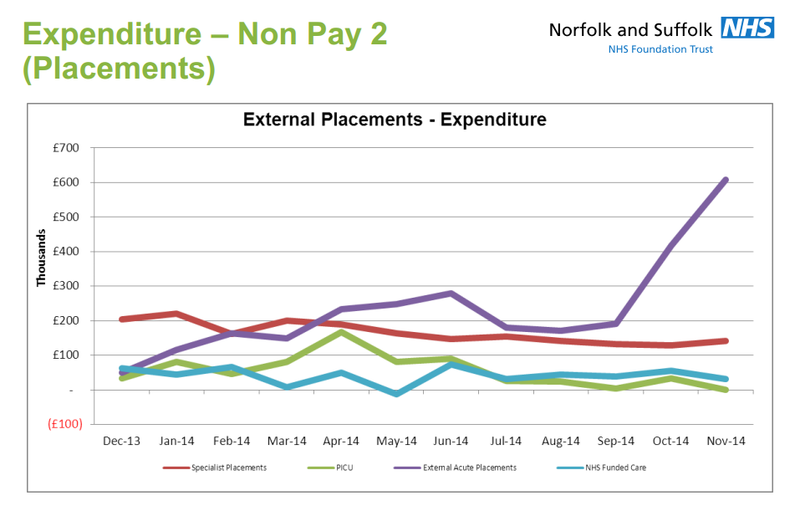 Remember that at the beginning of this year, the head of North Norfolk CCG, Mark Taylor, on behalf of the Norfolk CCGs and NSFT, told the Norfolk Scrutiny Committee that there would be no out of area placements beyond the end of April 2014 – that deadline passed more than six months ago. Norman Lamb, North Norfolk MP and the government Minister of State at the Department of Health directly responsible for mental health, called out-of-area placements ‘ridiculous’ and ‘totally unacceptable’ back in May 2014. Jeremy Hunt, Secretary of State for Health, called the use of out-of-area beds ‘unacceptable’ back in June 2014. The Operations Director of NSFT and architect of the radical redesign, Kathy Chapman, currently on mysterious secondment but due to return to NSFT in July 2015, repeatedly promised that wards would not be closed until it was demonstrated that they were no longer needed. But still the beds crisis gets worse and worse. We should all be very worried, given that, even with the re-opening of ten beds at Hellesdon Hospital, the closure of adult acute beds at Carlton Court and the ‘decant’ beds at Ashcroft will increase the pressure on beds and community and crisis teams further still. How can they not renew the contract for the 6 “decant” beds at Ashcroft given the pressure on inpatient beds and the number of “bed-days” in out of area private hospitals. Would the Trust and the CCGs prefer to spend a fortune supporting private hospital groups like the Priory, Cygnet Group, Partnerships in Care etc ( Charging £500+ a DAY ) rather than fund a non-profit, respected voluntary provider like Julian Support ( Charging £500+ a WEEK ). THe Ashcroft beds could be used as alternatives to admission. What about Norman Lamb’s Better Care Fund, which I understand is a joint fund between Social Services and Health in order to reduce the pressure on beds at the Norfolk and Norwich Hospital. If Norman Lamb believes in Parity of Esteem why isn’t there such a fund which could be used to fund these 6 beds at Ashcroft and thus relieve the bed pressure on Hellesdon Hospital. Why does Norman Lamb not intervene in this issue? Why did the trust employ fat cat director of psychology services Ian RObbins who did nothing but damage the morale of the psychology staff and bring in an antiquated dictatorial approach and then send him off with a huge redundancy pay out?